Blaine does so LOVE to cook, and to work with Dawn outside in the Vegetable and herb garden. 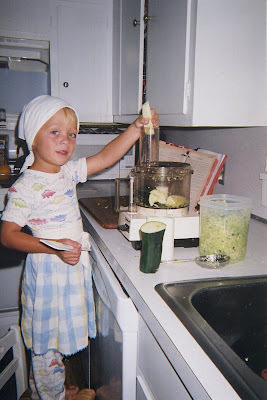 Here is the little Chef in the kitchen, making preparations for cooking TONS of Zuchini Bread. He is really reliable, and will grate the Zuchini on his own, letting me get things prepped for the mixing and cooking part of the Zuchini Bread.